You all know I’m a huge fan of raw salads, but sometimes I crave my greens with a little warmth. For this salad I roasted the kale in the oven which gives it a nice crispy yet tender bite. Now, don’t be fooled by appearances. 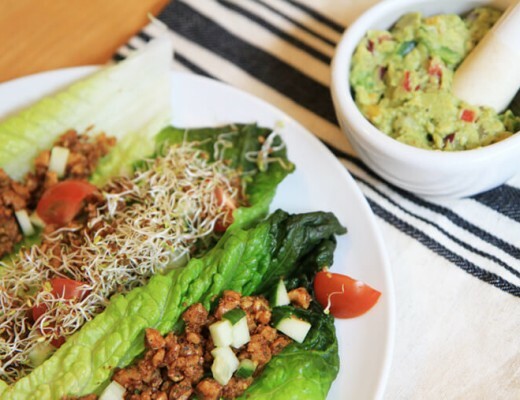 This salad may really only have a few ingredients, but it is a whole lotta delicious. Sometimes combining just a couple seasonal elements in a simple way, allows each ingredient to shine without a lot of fuss. For a main course, this is on the lighter side. Feel free to add some quinoa or brown rice to make it a heartier meal. Kale is an excellent source of vitamin A, vitamin C, vitamin B6 and manganese. 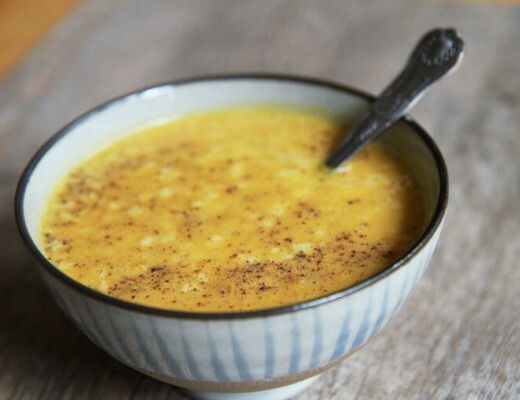 It is also a very good source of dietary fiber, calcium, copper and potassium. This combination of vitamins, minerals, and phytonutrients makes kale a health superstar, for real. It is also the richest source of carotenoids in the leafy-green vegetable family, making it a top cancer-fighter. The calcium in kale is more absorbable by the body than milk (and ounce for ounce, contains more calcium than milk)! This makes it an excellent choice for both prevention and treatment of osteoporosis, arthritis and bone loss. I think you’ll be surprised how easy and tasty this kale preparation is! Why not give it a try this weekend? Rinse kale and pat dry thoroughly. Roughly chop leaves. Toss with olive oil, salt and pepper in a large bowl. Spread on to a single layer on a baking sheet. Bake for 15 to 20 minutes, stirring every five minutes or so, until the edges are crispy and browned and the centers are wilted. Remove from oven, let cool to room temp. Add scallions, parsley, sunflower seeds and nutritional yeast before serving. Enjoy! I am soo making this! 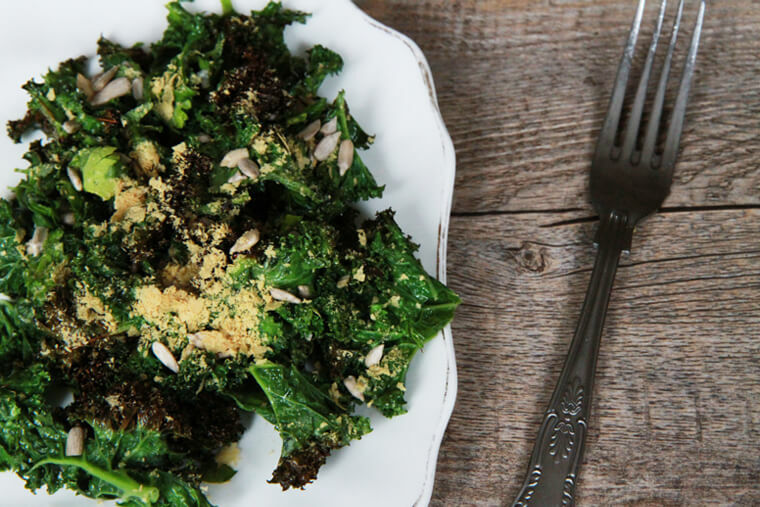 It’s like kale chips meets salad – the best of both worlds! This dish is almost too simple to even call a recipe! Haha. I’m not the biggest fan of kale, but I love the flavor and texture of it after its been roasted. That’s probably why I made a complete meal out of it ;) You’ll have to let me know how you like it! 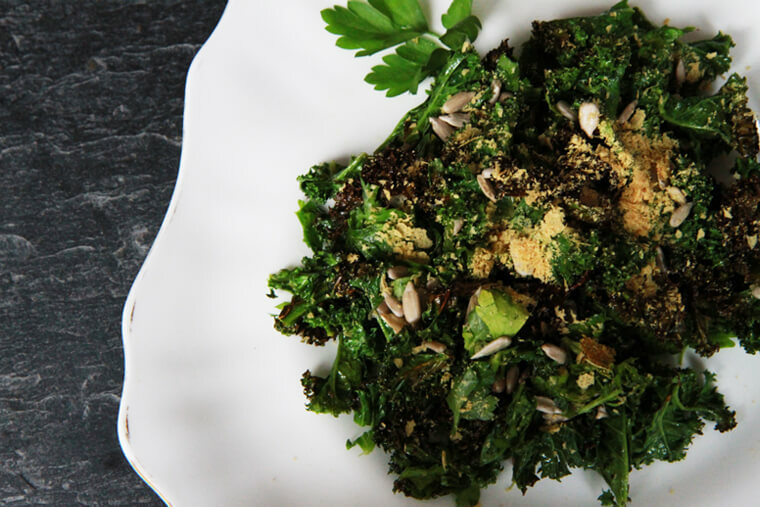 due to cold weather, i have been putting cold salads away for a while but this kale warm salad sounds so delicious. will have to try it.